The United States Congress designated the Monarch Wilderness (map) in 1984 and it now has a total of 44,216 acres. All of this wilderness is located in California and is managed by the Forest Service. The Monarch Wilderness is bordered by the John Muir Wilderness to the north and the Sequoia-Kings Canyon Wilderness to the east. At the southern end of John Muir Wilderness, on the western border of Sequoia-Kings Canyon National Park, Monarch Wilderness amply lives up to its regal name. Few areas of the United States can boast such an abundance of extravagant mountain scenery. Big mountain views of Deer Ridge and the Monarch Divide may be among the best in the world. Formerly known as the High Sierra Primitive Area, this wildland is steep and rugged, with high ridges standing above deep canyons. Mountain meadows, numerous streams, shallow lakes, and spectacular multicolored rock formations throughout the Wilderness add to the wonder. 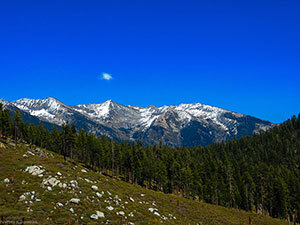 Elevations range from about 2,000 feet on the banks of the South Fork of the Kings River to 11,077 feet on Hogback Peak. Brush and oak woodlands cover the lower elevations, giving way to pine and red fir, and, finally, giant sequoias in the higher country. The ragged, brushy terrain in the northwest area of the Monarch Wilderness (in Sierra National Forest) has no trails, and travel is extremely difficult. Trails in the southern area of the Monarch Wilderness (in Sequoia National Forest) are mostly steep and strenuous. Sheer ruggedness has kept visitation light despite the fact that CA State Highway 180 splits the wilderness. The Deer Cove trail from highway 180 rises 3,000 feet in four miles. This one trail provide access into the northern side of highway 180, and the trail leads from the Deer Cove trailhead into Kings Canyon National Park. The two trails in the southern side of Highway 180 are the Deer Meadow trail from Big Meadows road and the Kanawyer trail from Kennedy Meadows trailhead to highway 180 near Cedar Grove campground. Planning to Visit the Monarch Wilderness? How to follow the seven standard Leave No Trace principles differs in different parts of the country (desert vs. Rocky Mountains). Click on any of the principles listed below to learn more about how they apply in the Monarch Wilderness.